Technion – Israel Institute of Technology won a NIS 10 million grant for the advancement of entrepreneurship and innovation as part of a “New Campus Vision” competition of the Council for Higher Education. 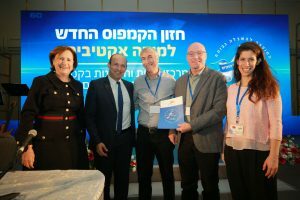 Israeli Education Minister Naftali Bennett and Chair of the CHE’s Planning and Budgeting Committee Prof. Yaffa Zilbershats announced the winners. The grant will be used to establish t-hub – The Technion Entrepreneurship and Innovation Center, based on the strategic plan for entrepreneurship and innovation formulated by the university during the past two years. Technion is the only academic institution to win the competition individually. Since its establishment, the Technion has championed the integration of basic science and applied research, striving to advance scientific knowledge while cultivating the desire to exploit it for the benefit of humanity. Technion has nurtured entrepreneurial thinking for many years and has pioneered the development of curricula for all students. The first entrepreneurship course was founded 30 years ago on campus, initiated by Distinguished Prof. Dan Shechtman, a Nobel Laureate in chemistry. Technion alumni are largely responsible for the creation of the “Start-Up Nation.” Within 20 years, since 1995, Technion alumni have established more than 1,600 companies that have generated more than $30 billion and created nearly 100,000 jobs. The university is also regarded worldwide as an incubator that fosters entrepreneurship and was recently ranked 39th in the world in the number of patents registered in the United States in 2017. Innovation and entrepreneurship are embedded in Technion’s DNA and much of the research conducted by faculty members has led to applications benefitting Israel and the world. A recent example is Mazor Robotics, which started out in the robotics lab of Prof. Moshe Shoham of the Faculty of Mechanical Engineering at Technion and was recently sold to Medtronic for $1.6 billion. t-hub will serve as a focal point for all entrepreneurial activities of Technion faculties; will encourage entrepreneurial thinking through teaching, research, and practical experience; and enable each student, faculty member, and others to experience entrepreneurial activities through centralized activities as well as by encouraging local initiatives. The Center will integrate values of entrepreneurship and creativity into campus culture, in study programs and in applying and commercializing research results with the aim of training engineers and scientists to lead technological innovation in Israel. This center will lead in harnessing the scientific activity on campus for the benefit of the Israeli economy and the world. t-hub will turn Technion into a leading center for scientific-technological initiatives that will serve the university and its surrounding environment. The Center will train Israel’s next technology leaders and strengthen its economy out of a national responsibility for promoting Israel through research, development, and technology. The Center will be headed by Prof. Eyal Zussman, the Center’s academic director and Dr. Dana Sheffer. The Technion’s Entrepreneurship and Innovation Center has many partners among Israel’s leading industrial and hi-tech companies including Teva, Rafael, and Alpha Omega.